One of the best highlights of this film is probably how well the visuals were executed. The scenery of the jungle is beautiful and it’s given a lot of depth with the 3D effects. The use of the CGI quickly adapts you to the idea that these animals feel and express themselves just like humans. If you're like me, you may actually believe that animals can literally talk for that hour and a half. With the combination of the human-like CGI infused with the animals, the addition of quality voice actors only makes the entire viewing experience that much better. 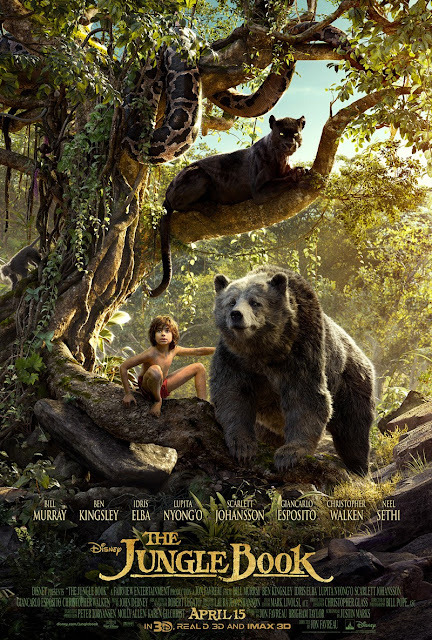 Ben Kingsley (plays Bagheera the panther) and Bill Murray (Baloo the bear) are fully immersed into their characters. Idris Elba is both intimidating and terrifying as the tiger, Shere Khan. (He almost reminded me of that drunk, abusive step-dad character in movies). Neel Sethi is a perfect version of Mowgli, and Christopher Walken as King Louie the Monkey king is just a perfect casting as well. What I personally appreciated was how this live-action remained faithful to the 1967 animated version. It seemed as though this film took all of the good parts and just went along with that. Even the songs were done pretty well without making this movie feel like a musical. It also had many humorous points throughout the film which kept the movie entertaining and fun for the most part. Another highlight is how the movie's characters able to connect with viewers on an emotional level. (It is a Disney movie afterall) It does deal with some pretty classic themes such as not fitting in with society, the sense of family, bullying, and much more. For example, when it's time to feel the motherly love between Raksha (mother wolf played by Lupita Nyong'o) and Mowgli, you feel it. When it's time to feel tense and frightened by Shere Khan hunting you down, you feel that too. I'm not sure how the 3D effects were shot but there are moments where it was just terribly blurry. It doesn't happen too often, but it was enough to notice. (Luckily the rest of the 3D effects don't overtake the viewing experience.) Besides that, the only thing I'd say is that this film's tone is a little darker than what many may expect. There are some jump scares and animal violence that more sensitive and younger audiences may want to be cautious about.